One gallon will cover approximately 50-70 square feet per coat. Two coats are recommended. A 100% acrylic, highly elastomeric, titanium fortified roof coating formulated to provide a high solids rubber-like membrane. Designed for use on metal, polyurethane foam, EPDM, APP, masonry, asphalt and wood surfaces. Forms a highly reflective barrier resulting in significant energy savings. Dries bright white. EDPM rubber roofs, polyurethane foam, APP and SBS modified bitumen, asphalt, mobile homes and RV’s, concrete, wood and more. NOTE: This product is not recommended for gravel, dead level (flat), or shingled roof surfaces. Clean Roof - Sweep off all dirt, dust, and debris. Remove rust, mildew, oil, grease, or other foreign material on the surface. 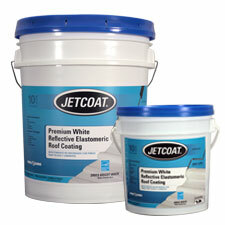 Allow freshly applied asphalt roofs to cure a minimum of 4 weeks prior to applying this coating. Scrub roof with roof cleaner or bleach solution (1 part chlorine bleach and 3 parts water). Rinse thoroughly and allow to dry. EPDM Roof: When coating EPDM roofs it is extremely important to remove all dust, dirt, and embedded clay to assure proper adhesion. Thoroughly scrub roof surface with roof cleaner or bleach solution (1 part chlorine bleach and 3 parts water) and pressure wash entire roof surface. Use a wide tip on pressure washer to prevent tearing roof material. Allow surface to dry. Applying Roof Coating - Stir pail thoroughly. Do not dilute. For best results apply White Elastomeric Roof Coating with a soft brush, 3/4” nap paint roller, or high pressure sprayer (Tip Size: .021 to .025). For optimum performance, durability and warranty purposes, apply a second coat. CALIFORNIA PROPOSITION 65 CHEMICAL WARNING: This product contains chemicals known to the state of California to cause cancer and birth or developmental defects. Forms a tough, durable rubber membrane over a variety of roof surfaces. 66215 4.75 gal. Pail 55 lbs. 66211 .9 gal. Can 11.3 lbs.